To connect to tigase.org server we need to configure the program. Below are step-by-step instructions for novice users on how to setup Psi. Psi can connect to many Jabber servers at the same time so we have to identify each connection somehow. The first thing to do is assign a name to the connection we just created. As we are going to define connection to tigase.org server let’s just name it: Tigase. Note! At the moment you can register an account through the Web site only. This is a single account for both services: The Drupal website and Jabber/XMPP service on the tigase.org domain. 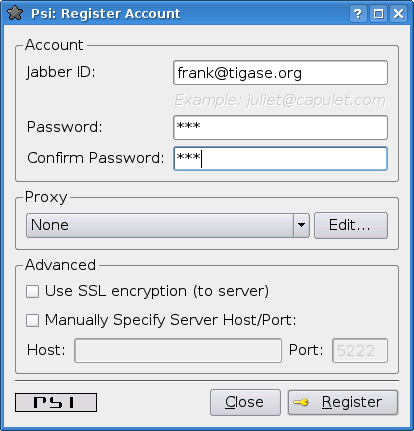 If you want to have a Jabber account on the tigase.org server go to the registration page, un-tick "Register new account", and go to the point no 5. 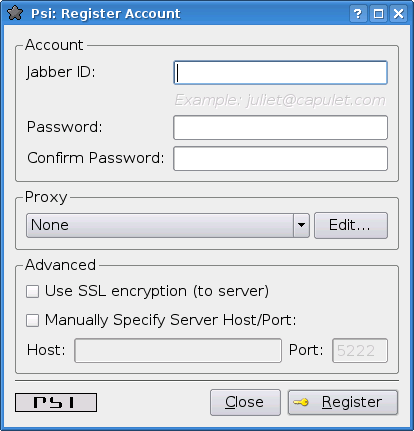 You can use guide points 2-4 to register a Jabber account on any other Jabber server. 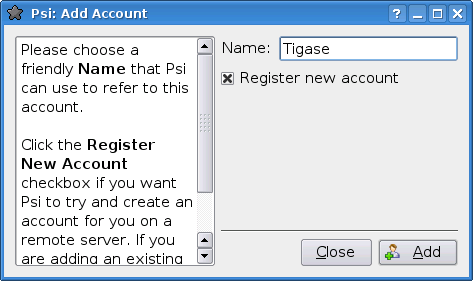 Invent your user name for the account on Tigase server. Let’s assume your user name is: frank. 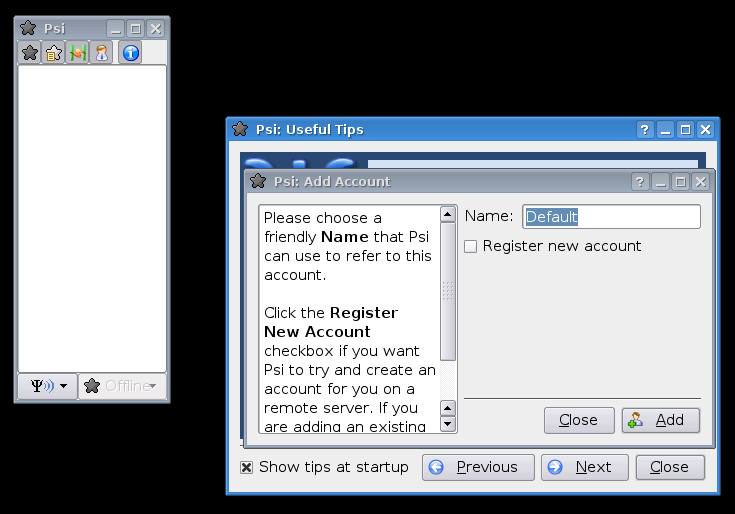 Jabber ID’s however consist of 2 parts - your user name and server address. Exactly the same as an e-mail address. 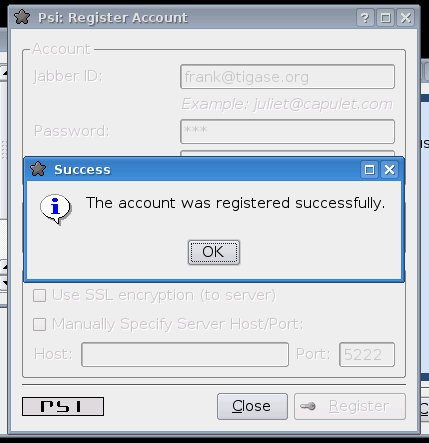 As you are registering an account on tigase.org server, you will have to enter in this field: frank@tigase.org. Next enter the password of your choice and click the Register button. It may happen that somebody earlier registered an account with the same name you’ve selected for yourself. If so, you will receive error message. You will then have to select another user name and try to register again. After clicking the OK button you will see a window with your connection and account setup. You can stick with default values for now. Just click the Save button and this window closes. Now you have your account configured and ready to use but you are still off-line. You can find out whether you are on-line or off-line by looking at the bottom of main Psi window. There you can see Offline text. Click on this Offline text and you will see a list of possible options. Just select Online. Well, you are now connected but how to talk to other people? How to add friends to the contact list? You can send a message to your friends straight away using the Psi menu option New blank message. It is much more convenient however, if you could see which of your friends is online and available for chatting and if you could start talking to your friend just by clicking on his name.